Summary: I'm showing you an easy and creative way to braid cord friendship bracelet by using several Opaque 8/0 Glass Seed Beads and one natural howlite bead! Hope you like it. 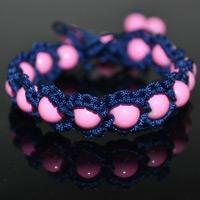 The cord braided friendship bracelet is a less costly and easy project and everyone can undertake without frustration. Please spare about 10 minutes and you will own a brand new ornament for your summer.Now let's see how to braided this bead friendship bracelet. How to braid cord friendship bracelet? Cut out a 100cm long korea cotton wax cord and fold it into four bounds, three equal-length strands and one short section to wrap them together. 4th, stop adding the Opaque 8/0 Glass Seed Bead and repeat the threading way with three cord strands. When get the ideal length of braided bracelets with beads, tie a knot; next lead the three strands through one natural howlite bead and end with another knot. 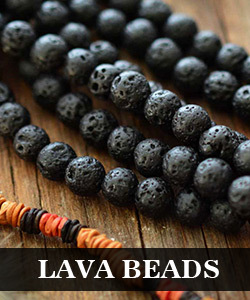 Once cut off the excess korea cotton wax cord part, you will own a gorgeous new bracelet for your wardrobe. Did this cord braided friendship bracelet arouse your interest? Whatever, a small tips for you while trying this friendship bracelet: bead all Opaque 8/0 Glass Seed Beads evenly onto three cord strands first, and tie a knot at end to prevent them from slip off. Hope this tips may be of some help to you!